GS Yuasa Battery Europe Ltd has helped to develop and build the world’s first container-based energy storage platform where lead acid and lithium-ion batteries are combined to feed a power conversion system. The ground-breaking unit will store and control the release of locally generated renewable energy back into the grid. GS Yuasa partnered with Infinite Group, the University of Sheffield and Innovate UK to develop the platform, called ADEPT (Advanced multi-Energy management and oPTtimisation time shifting platform) which has been constructed at their battery manufacturing facility on the Rassau Industrial Estate in Ebbw Vale. ADEPT is unique and completely self-contained within a shipping container, allowing it to be integrated rapidly into any renewable energy micro-grid configuration and avoiding the need for internal space. The platform features two GS Yuasa battery systems; a 75Kw hour lithium-ion battery system of 36 GS Yuasa LIM50 modules alongside a 250 Kw hour Valve Regulated Lead Acid battery system of 240 Yuasa SLR500 cells. The two systems are connected to a 100Kw bi-direction power conversion unit as well as full monitoring and battery management systems. 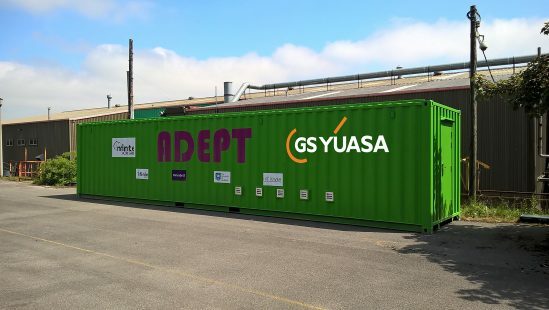 ADEPT uses the GS Yuasa dual chemistry battery system, which stores the energy generated by wind turbines on the industrial estate and solar panels on the roof of the container. This renewable energy is then released, under the control of the ADEPT micro-grid manager, into the GS Yuasa plant to provide optimum commercial benefit from demand management services. This balances the unstable, varied nature of renewable production and provides optimum energy security. The first of its kind project has been a great success, delivering on all set objectives, including performance and cost. Multiple orders have been placed for the energy storage system and it is due to be rolled out to several other sites across South Wales in 2019.